Just days after the New York Supreme Court struck down a ban on unvaccinated children in Rockland County, New York, after declaring a state of emergency over a measles outbreak, New York City Mayor Bill de Blasio has taken even more drastic actions in certain Jewish populated neighborhoods in Brooklyn, ordering forced vaccinations for measles. “There’s no question that vaccines are safe, effective and life-saving,” de Blasio said. “I urge everyone, especially those in affected areas, to get their MMR vaccines to protect their children, families and communities.” There have been no reported deaths due to measles anywhere in the United States this year. 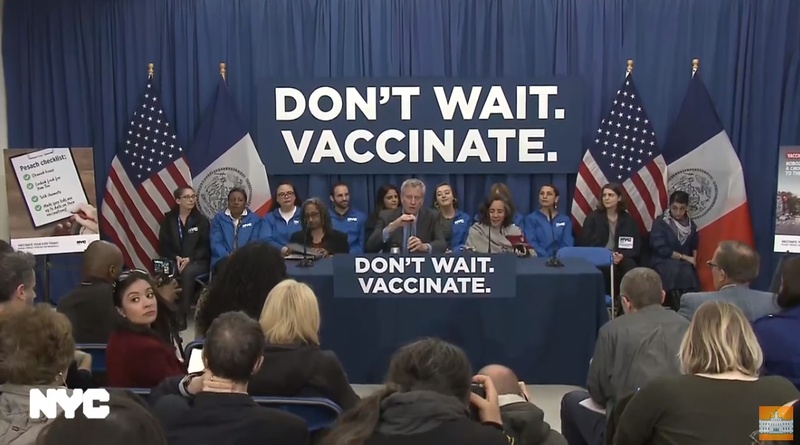 The Mayor's order goes beyond what Rockland County Supervisor Ed Day ordered, and includes EVERYONE who is unvaccinated within zip codes 11205, 11206, 11221 and 11249 which are part of Williamsburg, Brooklyn, to be vaccinated within 48 hours. Absolutely criminal! Forcefully being injected with toxic aluminum, mercury & other toxins directly into the bloodstream, borders on sheer insanity! Those committing these crimes & destroying lives, ought to be prosecuted to the fullest extend possible!! It has been established by the Supreme Court in Brucewitz vs Wyeth labs that vaccination is " unavoidably unsafe". De Blasio should be indicted and arrested for premeditated attempt at crimes against humanity. Another religious witch hunt against Jews .